The three cars are the CP woodchip car from my previous post, and another pair of 40′ boxcars that will also be lettered for Canadian Pacific. 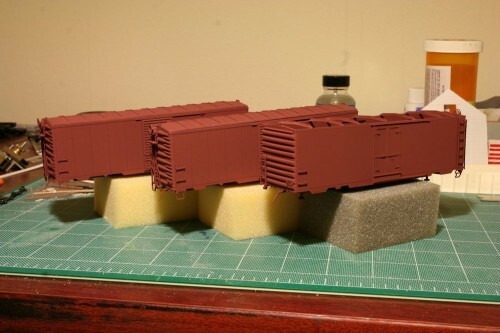 This entry was posted in CP Boxcars and tagged Boxcar, Canadian Pacific, CP, Model, Woodchip by Chris van der Heide. Bookmark the permalink.